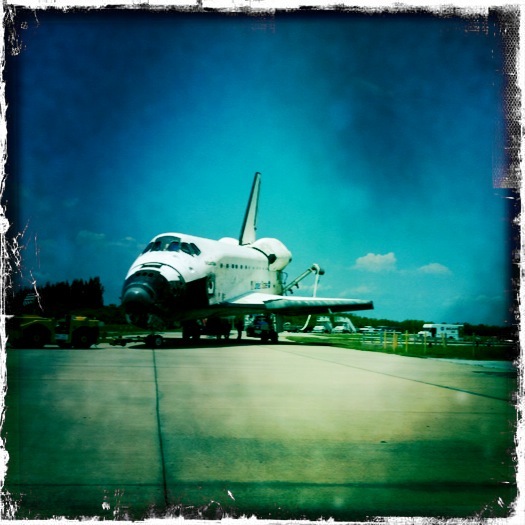 One week ago today, STS-135 Space Shuttle Atlantis landed on Earth for the final time. 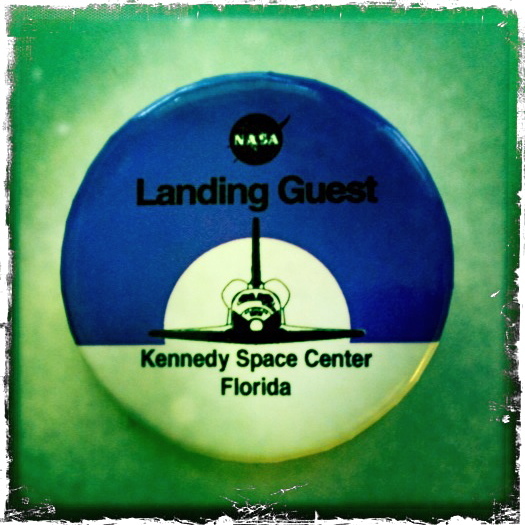 STS-135 Final Space Shuttle Landing Guest Button. Last Thursday, I left my Cocoa Beach hotel at 3:00 a.m. to head out to the Kennedy Space Center to meet the space tweeps who would share this historic moment STS-135 Landing Tweetup with us. I’d never seen a Space Shuttle landing before. This would be my first…and last. After checking in all our landing tweeps, we boarded the bus around 4:30 a.m. — Zero-Dark Thirty!!! We waited for news of STS-135 Atlantis in orbit. Only at Deorbit Burn could we head out to the landing strip. Ah the anticipation. But still, it was really, REALLY early. 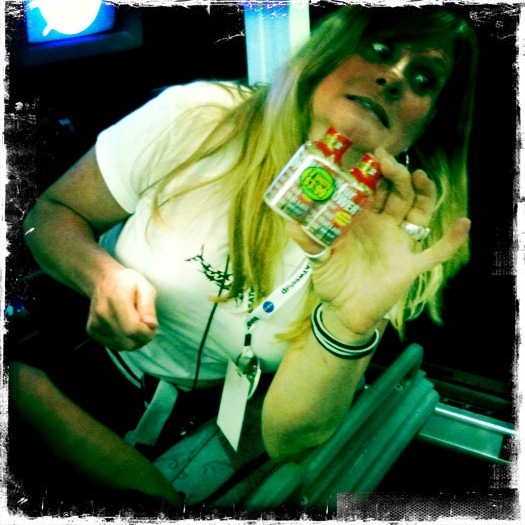 Thankfully, some came well-equipped with Red Bull and Energy Drinks!! @sharkb8t is a zombie without her energy drinks! @CraftLass & her husband @WoodToast w/ space critters. We received news of Deorbit Burn! WooHoo! Our bus driver pulled out of the parking lot. We were on our way. 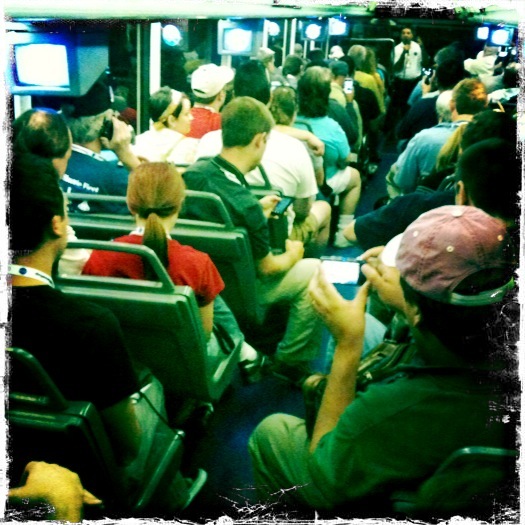 Deorbit Burn means NASA Tweetup Bus is moving! Not long into our journey, we slowed to a crawl in snarled “final landing” traffic. @WiredForFlight and @FlightSoft checked an iPad app to track our progress on the road. @WiredForFlight + @FlightSoft watching our progress in Landing Traffic. 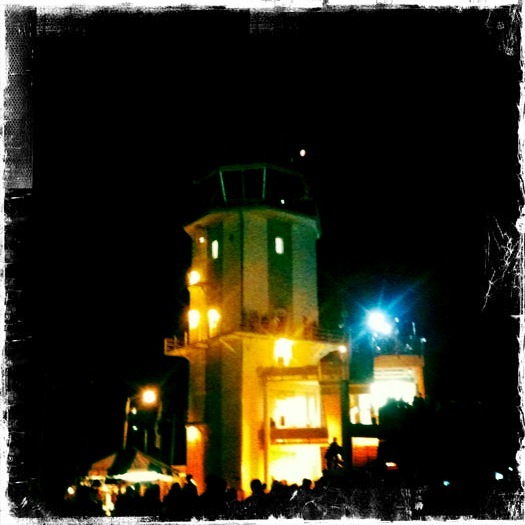 Once we arrived, we headed to the viewing stands. I was hoping the sun would defy nature and rise early so we could see Atlantis drop from the skies. But no. 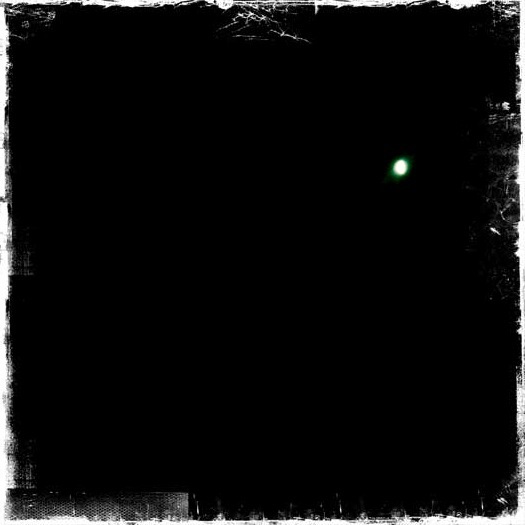 Still dark. As we waited for Atlantis to land, the Expedition 28 crew onboard the International Space Station streaked across the sky at 17,500 mph. What an amazing treat to wave to @Astro_Ron Garan, Mike @Astro_Aggie Fossum and their crewmates 220 miles overhead. Space Station crossed sky just before STS-135 landing. Atlantis landed just a few minutes after Station crossed the sky. I expected to cry, but instead, I squealed and giggled. This was my first landing. It was more first than last to me. I felt incredibly giddy. What a treat to be part of history! We all boarded the bus again, and said goodbye back at the media badging building. 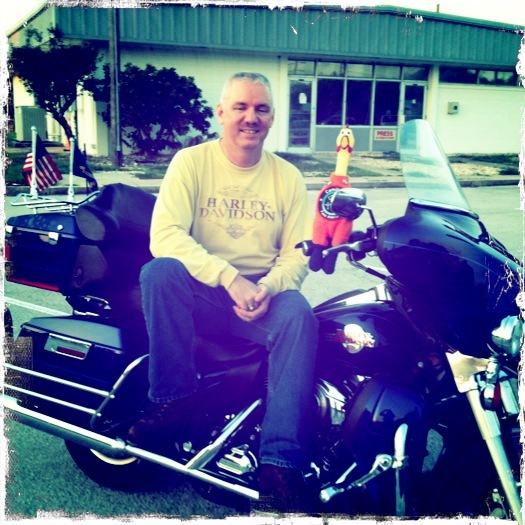 @WinObs rode off into the sunrise on his bike, but before he left, he posed with @Camilla_SDO. 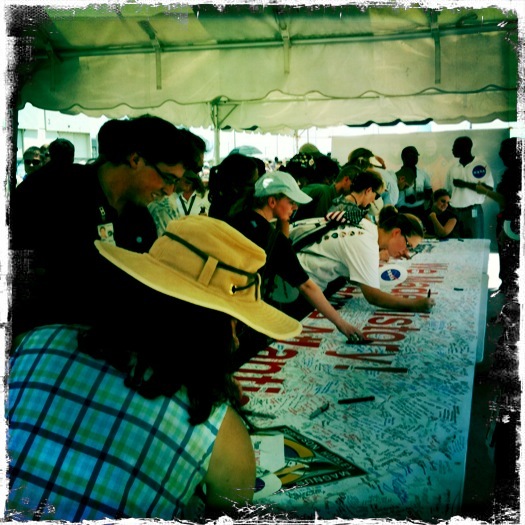 @Camilla_SDO gets around. Here she is with @WinObs. I headed back to Cocoa Beach to check out of my hotel and grab breakfast with Madi Sengupta and Mary Lynne Dittmar. Next we headed over to the launch pads of our past — Apollo, Gemini, and Mercury. The Apollo pad is well cared for. Gemini and Mercury, not so much. Walking among the ruins, I imagined ghosts of rocket boys with crew cuts and slide rulers who paved the way for the Space Shuttle generation. Apollo, Gemini, and Mercury launch pads. One of the highlights of the day: attending the employee celebration with Atlantis post flight! 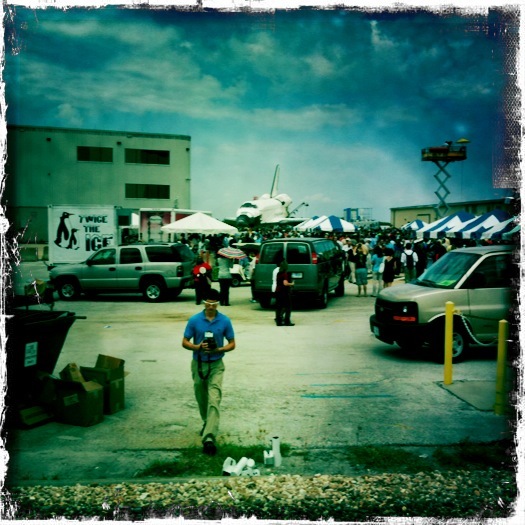 Here is my first view of Atlantis, the star of the party. 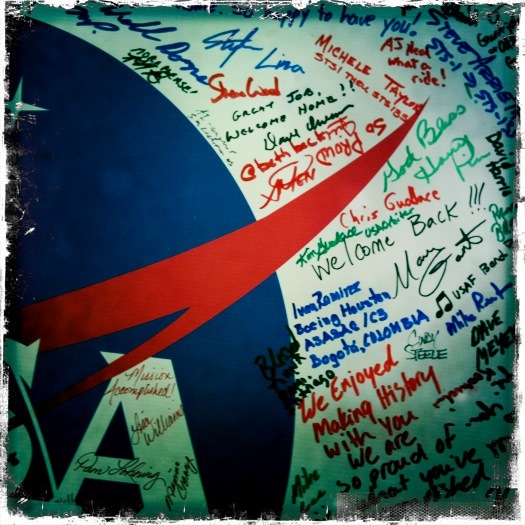 Employees salute Atlantis, the final Space Shuttle. Thank you Stephanie Schierholz for making the landing tweetup happen. What a glorious day. Sad because it’s the end. But what a wonderful 30 years we’ve had! 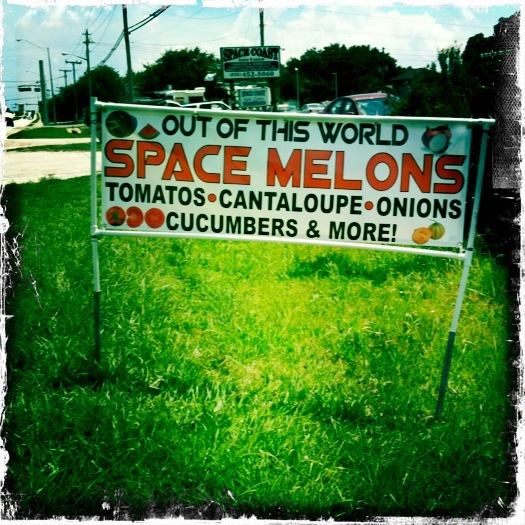 Space Melons: only on the space coast. On the flight home, the flight attendant read aloud a note someone gave him, recognizing the last Space Shuttle landing and the end of an era, as well as the NASA Administrator in the front row and other NASA employees on the flight. The passengers broke into applause. Tears streamed down my face. The end. It finally hit me. 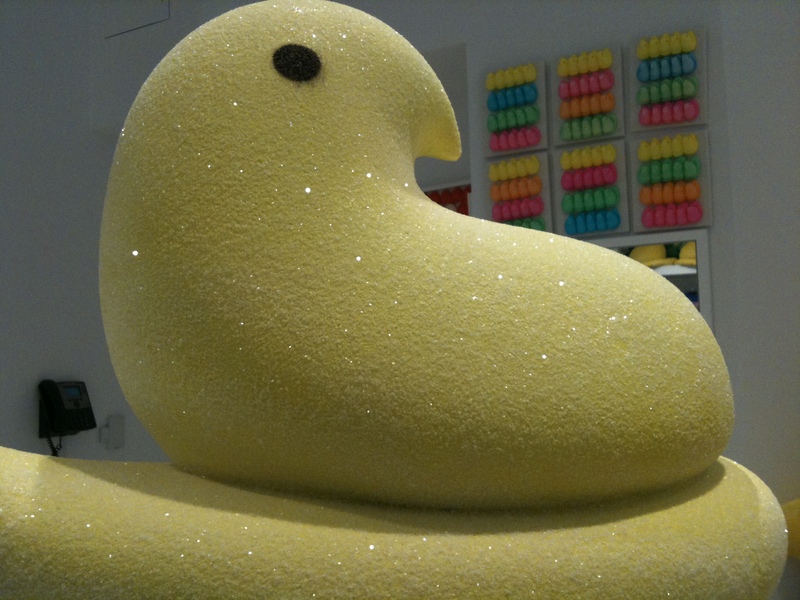 I dearly love the Washington Post Peeps Diorama Contest each year. 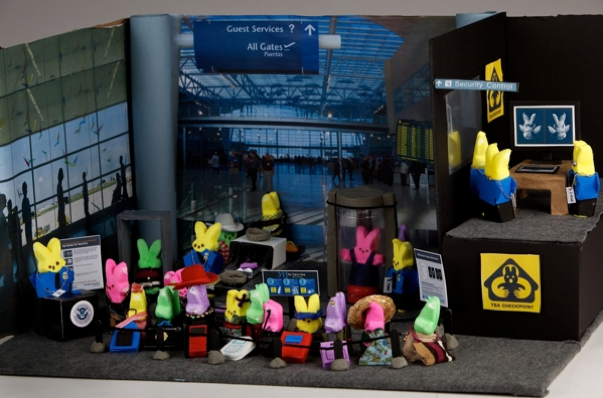 Personally, I like the TSA Peeps Show the best. Too funny! Creators: LeElaine Comer, Kasey Wiedrich, Kristin Lawton, Ethan Geiling, Michelle Nguyuen, Kim Pate, Jane Hanley and Ida Rademacher. For all you space enthusiasts, I’m resurrecting (good Easter word) a diorama created for the Washington Post contest a few years back by a group of NASA folks to celebrate the Apollo missions. 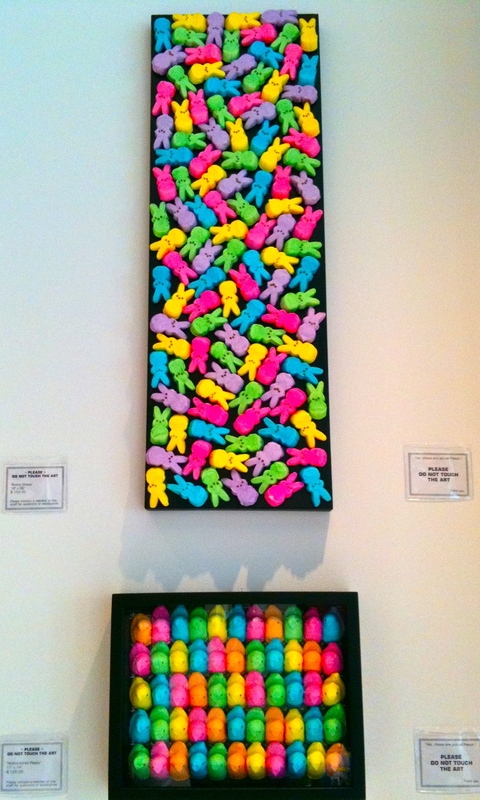 I leave you with a few images of Peeps Art from the local Peeps Store at the Washington Harbor. 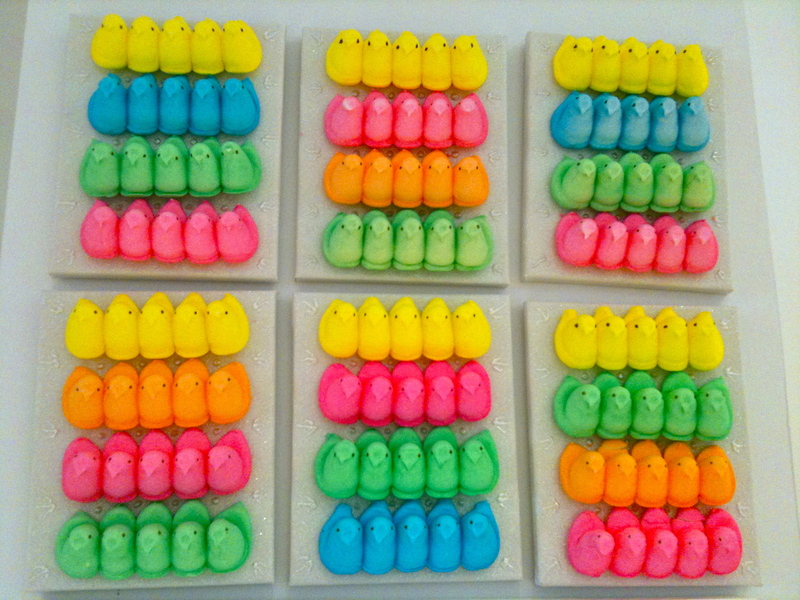 How can you NOT smile at the adorable Peeps? As much as I love bunnys and Easter eggs and Peeps, I celebrate for the real reason for Easter: Christ is RISEN. Honor Past but Celebrate Future, PLEASE! Kennedy Center “Salute to Apollo: The Kennedy Legacy” with the National Symphony, Chaka Kahn, Denyce Graves, Jamia Nash. Buzz Aldrin and Scott (Scooter) Altman will narrate for the Orchestra. All the Apollo astronauts and the crew of STS-125 are invited, along with our new NASA Administrator Charlie Bolden and Deputy Administrator Lori Garver. John Glenn Lecture Series at the National Air and Space Museum will feature the Apollo 11 crew and legendary former Johnson Space Center Director Chris Kraft. Charlie and Lori are invited, as well. Various media events for the Apollo astronauts,n and a private lunch. Newseum 40th Anniversary Educational Forum featuring hunky George Clooney’s dad, Nick, as moderator. Panelists include: Apollo astronauts @TheRealBuzz Aldrin, Charles Duke and Alan Bean, along with STS-125 crewmember John Grunsfeld and Goddard’s Dr. Laurie Leshin. Evening Reception at the National Air and Space Museum. Dr. Neil DeGrasse Tyson will MC the event honoring Apollo astronauts and former Apollo employees — of whom we have a handful still working at NASA Headquarters. Plus, Kathleen Kennedy Townsend will accept the Ambassador of Exploration Award on behalf of the late President John F. Kennedy. Capitol Hill Congressional Gold Medal Presentation to Apollo 11 crew. Appreciation Social with NASA Headquarters employees to honor Apollo astronauts. This list is the tip of the iceberg. I can’t begin to list all the Apollo celebration events hosted at the NASA field centers. Yes, we have much to celebrate at NASA. We’ve done some amazing things never thought possible four decades ago. We have every right, and responsibility, to reflect and honor the courage, dedication, daring, and engineering genius that lofted humans to the heavens. How boldly incredible is this accomplishment? Really! 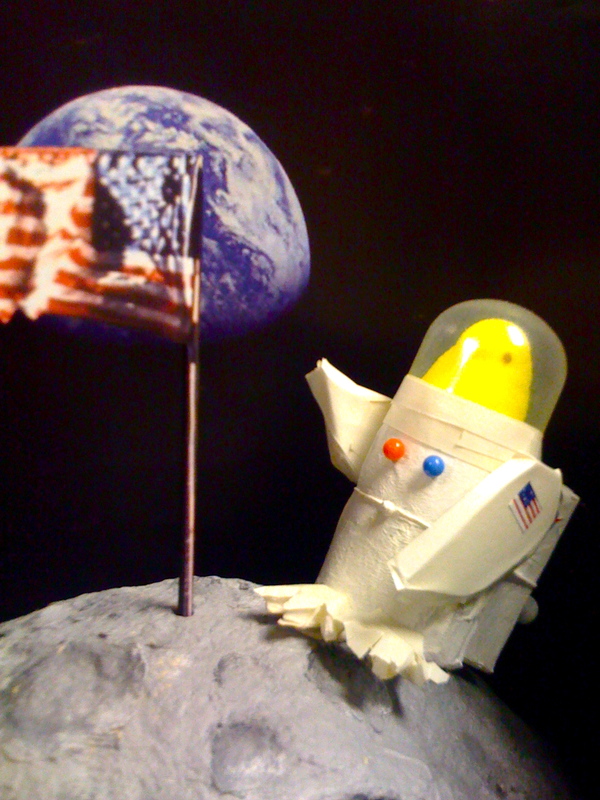 Bravo to all who played a part in the foundation of our space program. But, here’s my quandary: We’ve spent a great deal of time planning for this anniversary. Just like we did for NASA’s 50th birthday. Meetings, telecons, vidcons, brain-storm sessions, product prep, website creation, and much, much MORE to pull together a respectable list of things to do. Some part of me can’t quite reconcile all this activity. 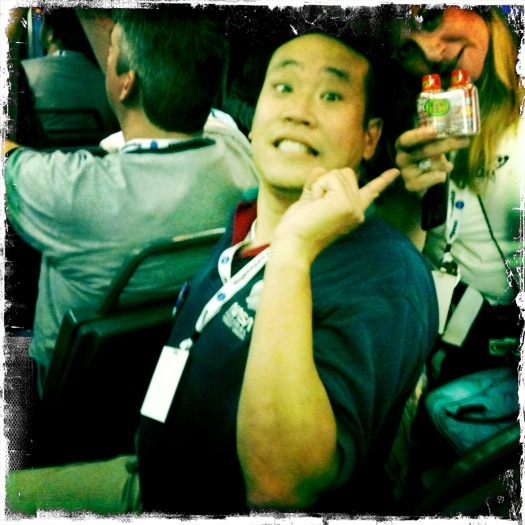 Does an agency retrospective propel us where we want to go tomorrow? I pose this merely as a question, rather than a conclusion. Believe me, I get that we need to honor those who got us here. I understand the need to look back and marvel at our greatness. It’s our culture. If reliving these momentous achievements (which they TOTally were) makes us smarter for the difficult endeavors we face in current and future programs, then YAY! Clean Water challenges to replicate waste water recycling like we practice in space. We are pioneers in sustainable living. Our technology enables crewmembers on Space Station conserve and reuse every drop possible. Orbital 365 events around the globe for every additional year we live/work/play on our incredibly complex orbital outpost — International Space Station. Light the Candle community celebrations held EVERY remaining Space Shuttle launch, AND for significant engine test firings for new vehicle development. Light Gardens created from home-made solar collectors to remind us how delicate and fragile the balance is between creation and consumption of energy, as our international crew of six onboard Station can attest every day in orbit 220 miles over our heads. Star-gazing festivals where we turn out the city lights and look to the skies together. Our brightest star might just be Station zipping across the horizon. I’m merely suggesting ideas to spark your imagination and get the conversation going. I’m not saying these celebrations would even work. But, then again, you never know ’till you try. Right? So, what’s stopping us? Come on! Let’s “pay it forward.” Tap into that amazing creative energy we have. Celebrate NASA’s today and tomorrow, while we honor the past.